Welcome to Northeast Tennis Center! Welcome to the online home of Northeast Tennis Center. Feel free to browse our website for information on our wonderful staff, adult and junior programs, summer pool memberships and everything else we have to offer! 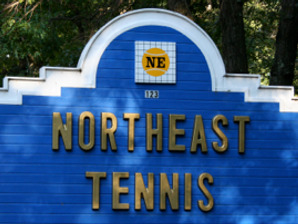 Northeast Tennis Center is a family-oriented, year-round tennis and summer pool facility located in Middleton, Massachusetts. The club has been servicing adult and junior tennis players as well as summer pool families on the north shore of Boston, Massachusetts since 1989. The Northeast Tennis Center family, led by Joe Palumbo (owner), and Bill Dunn (general manager), is focused on ensuring that all of our members and guests have a wonderful tennis and pool experience. Over the last several years numerous improvements have been made to the club, including a completely redone clubhouse with a new kitchen area, new furniture, new carpeting, multiple new seating and viewing areas and a WI-FI access bar, as well as a brand new outdoor deck and seating area for our tennis players and family pool members. Our outdoor adult and kiddie pools were redone in the last few seasons, and a new deck was built for our summer families to enjoy. 2 years ago we put in a new ceiling for our tennis courts, new siding on our building, a new pool shed with a changing table, a new fence for the pool area and gorgeous new landscaping. We value our members’ patronage and take pride in our club, and want to make sure that everyone who joins or visits us feels like a part of our family. We welcome anyone interested in becoming a member to visit us, take a tour and meet our staff. Our staff welcomes your thoughts and ideas on how to make Northeast an even better place for our members.